I'm always looking for new (to me) and interesting Indian breads. Especially breads I can serve at Indian banquets. It seems that my Indian banquets always begin with me at the stove frantically sticking my hands in the fire (yes, I have almost no nerve endings left after 20 years of doing this) making chapattis at the last minute so they'll be nice and hot and puffy. By the time I'm finished, my make-up is usually a sweaty, runny mess, my hair has frizzed up, and I totally get why kitchen wallahs are left in the kitchen after the food has been prepared. Who wants to look at that? However I have to make my way to the table and hostess. So, when I ran across a bread that had originated by being left in the desert, buried under sand all day and unearthed for eating later, I was so there. They had me at left all day. The bread I'm talking about is called Baati and is a specialty of the state of Rajastan. Translated, Rajasthan means The Land of the Kings, and the people of the region were renowned for their warrior skills and chivalry. What can you say about a bread that was traditionally made by some of the fiercest warriors of the sub-continent and left to bake under desert sands all day with a marker to guide them back to bread deliciousness when all the conquering was done? Nifty? Ingenious? Try On the Menu! These guys were not just Kings of Rajasthan. To me they were the Kings of Make-Ahead which of course is one of my favorite lands. So, I thought going into my New Years Eve bash that if I baked Baati, my makeup might possibly stay on my face instead of giving me Marilyn Manson eyes. I really hadn't cooked many dishes from Rajasthan before. It's a area with a great deal of desert and a very arid climate. The food is mainly vegetarian, focusing on lentil dishes. Ghee abounds, and since there is not a lot of water readily available, they make up for it by using milk, buttermilk and ghee to cut down on the amount of water needed for cooking. It's a rich and complex cuisine. Baati is traditionally served with dal, but it can also accompany other curry dishes and sometimes is even stuffed like a samosa for a hearty complete meal. The Baati I made was just a simple bread, and once the dough is set can be popped in the oven on a baking sheet with very little effort. This recipe makes about 16 Baati, they're small but full of ghee so you may want to halve this amount. Make a little space in the center of the dough, pour in 1 and 1/3 cup of water and mix it around. When the water is all mixed in, knead the mixture into a nice soft dough. Cover the dough with a damp cloth and set it aside for 10 minutes. Take the cloth off of the dough and gradually drizzle into it 1/3 cup of melted clarified butter or ghee. Then cover it again with the damp cloth and let it take another 10 minute nap. Now the dough is ready to be shaped. Divide the dough into 16 small balls and place them on a greased baking sheet. Cover them with a damp cloth and let them sit for another 10 minutes. Flatten each ball slightly, cover them and keep 'em aside till you're ready to bake. When you are ready to bake them, put them into the oven for about 18 minutes or so. Now for the fun and guilty part. When these little gems come out of the oven, poke them with your finger, crack the crust a bit and drizzle each with some more of the ghee. Hey, if you're busy defending your kingdom from marauding hordes, don't worry about the ghee... you'll work it off. Okay, I just couldn't leave these delightful little morsels alone. I had a bit of leftover dough so the next day I decided to pair this bread with a couple of vegetable dishes and experiment with removing the extra ghee. I took my dough, rested it and then flattened it a bit more than I had the night before. I baked them and served them ghee free. There they were denser than a chapatti, not risen like naan bread they were...Baati! I pulled one apart, it opened full of steamy flaky goodness. I could see that all sorts of tasty morsels could be made to fit inside, they were little pockets of whole wheat goodness, and of course since they weren't drizzled with ghee I felt so virtuous eating them. Did they work on the table? Yes they did. Would I make them again, absolutely! In fact I can't wait to serve them, this time as part of the traditional Rajasthani Dal Baati Churma meal. Because everybody needs some Baati sometime. Sorry, I just couldn't help myself. Those look amazing. Now I want to try them. Maybe we should make more Indian food this weekend. Hey, do you have the Vij cookbook. I love that book. I want to eat at your house. I am now drooling over the Baati. Oh, I LOVE baati! It's not easy to find it around here...but maybe, I'll have to give it a go myself! 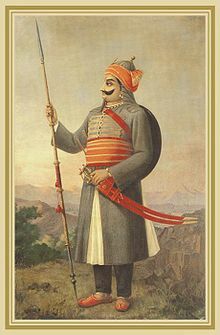 i am really impressed by your knowledge of Indian food..i am a rajput and we come from the same community as rana pratap singh's! i am right now livin in bihar which is in the north part of india..
the batti's version here is called "litti" which is made in the same way as "batti "is made but stuffed with "sattu" n a bunch of other stuff.. and itz real yum!! Oh that just looks DELICIOUS! thanks, I've been learning about the different types of baati and I'm really excited to make some more of them, especially with dal. definitely try it...it keeps well(the dough) in the fridge too. no, I don't have Vij...Paula gave me a whole bunch of stuff that I'm working my way through. I made a cabbage casserole side dish yesterday that was amazing!We really ought to have a virtual Indian dinner..everyone make a dish sort of potluck and see what we come up with. Sort of like Jeroxies aka International Incident Parties...only we're only responsible for one dish and they're all different. mmm, love the flakiness. those look delicious and could go with anything. It can become pockets of goodness isn't it? Thanks for this interesting post - I love the background info and history of food too. And the pun at the end as well- this some Baati was impressed! I remember finding my first tin of ghee when I moved to London and being really excited by what I would make. I love bread and Indian bread is no exception. This recipe is a good combo for both. Interesting Indian Breads. looks amazing.